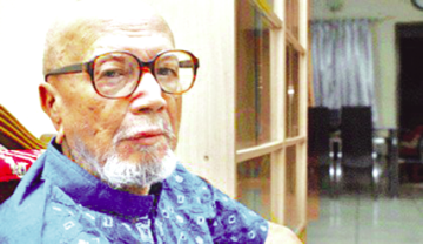 Celebrated Bengali poet Al Mahmud was admitted to the intensive care unit of Ibn Sina Hospital in Dhaka yesterday following deterioration of his health, reports New Age. Abid Azam, a family friend to the poet, confirmed the matter to journalists saying that Al Mahmud was suffering from pneumonia and old age complications. “He was first admitted to Coronary Care Unit of the hospital and later transferred to ICU on early Sunday,” he added. The poet is undergoing treatment under supervision of physician Md Abdul Hye. Rahman said Mahmud’s blood pressure and pneumonia is under control. Born on July 11, 1936, at Maurail in Brahmanbaria, Al Mahmud is also very popular for his novels and short-stories. He is considered one of the greatest Bengali poets to have emerged in the 20th century. The Ekushey Padak winning poet’s works in Bangla poetry is dominated by his frequent use of imageries of rural Bangladesh. Mahmud’s personal ideologies experienced a shift in the mid-70s. As a result, he faced widespread criticism for his tilt towards ultra-right politics.